Sail of Cortez is a 1972 22' Catalina sailboat. Purchased on April 5th, 2003 from an eBay auction for $325. 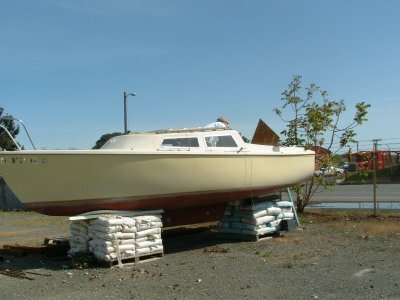 She was in great shape, with the exception of missing the mast and rudder. We hauled her home from Benecia, California where she had sat for some time. 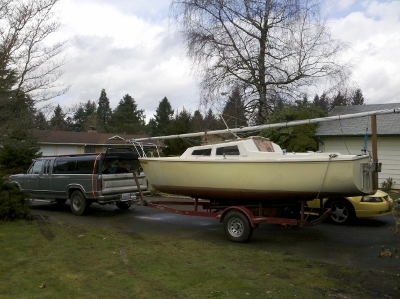 We eventually bought new rigging, found a mast and rudder locally, and sailed her a few times on the Columbia River. But, to be honest, sailing on the Columbia, particularly in the Camas/Washougal area with it's fast current, was just not that much fun. So we decided that we would take her up to my place in Tacoma, where we could then sail her out on Puget Sound, where the currents are not always pushing you downstream. We would have the wide open sound to go where we wanted. It was a great idea. It never panned out. Our boat sat on her trailer, covered with a tarp, for almost six years - never moving from her spot under the fir trees. So in 2010, after spending some time with our friends on their C-22 at Topaz Lake, Nevada, we came up with a better idea - since Nick and Julie (our hosts) also had a place near ours in Mexico, we would take the Sail of Cortez down to our place in Los Barriles, in Baja California (seventy miles north of Cabo San Lucas). And that's what we did. In March of 2011, we hooked the Sail of Cortez to our F-250 and made the 2200 mile trip down the west coast and the Baja penisula. We made quite an adventure of it, stopping to see relatives along the way (in Medford, OR and Escondido, CA). We took a week to make the drive down Baja, enjoying ourselves (Debbie, daughter Dusti, grandson Dylan and I) as we stopped in previously unvisited Mexican towns. We got her down there with no serious problems, and put her into the water with the help of our friends, Nick and Julie Rauber. She has since seen more sail time (by us and them), then she may has seen in all her life. The Sail of Cortez has definitely found her home (or, more appropriately, ella ha encontrada su casa nueva). Stay tuned for more advetures as we explore the Sea of Cortez with our little blow boat. �Hasta la vista, Baby!